Thank you Send Hope Not Flowers for your ongoing support! 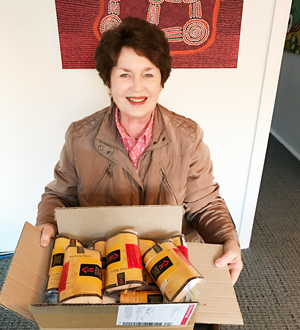 A sincere thank you to my gorgeous mother Diana (pictured) and sister Kylie Adams for their tireless efforts in packaging the birthing kits. Perfection always. Another 50 Birthing Kits have gone back to Port Moresby with our In-Country manager Toks. Wonderful to recently meet up with Toks in Australia and talk CFK business. Sydney’s rain today reminds me of…. I returned from Kiriwina over the weekend to POM. Attach is the photo of the items delivered. I delivered the items sent from Australia and the three phones. All the things were given to Ruth Boaz to distribute. The phones will be given to Ruth, Diane and Bokawau. I received the sewing machines from Gina over the weekend. The electric one will remain in Pom for Caring for Kiriwina use and the hand sewing machine will be taken home and donated to the VBA’s on Kiriwina. Everyone on the island are well and busy with harvesting of yams. Thank you to everyone, these items are very needed.